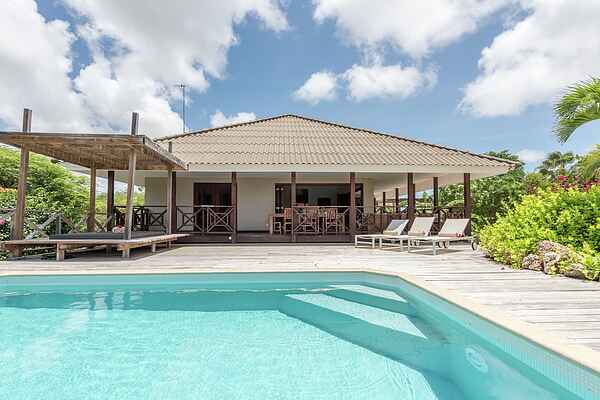 Villa Azzurra is a lovely tropical villa with private swimming pool in the popular area of ​​Jan Thiel. Also known as the Saint Tropez of Curacao, there is always something happening on this part of the island. The villa has a partial view of the sea. Azzurra is a very comfortable villa for up to 6 people with a beautifully landscaped garden, an outdoor shower and a wooden decked pool terrace with loungers. The climate and the refreshing sea breeze make outdoor life on the wooden verandas very pleasant. From the veranda, you can overlook the private pool and a small part of the sea. Villa Azzurra is within walking distance of the beach (Jan Thiel/Zanzibar). The famous Jan Thiel luxury villa estate is located directly on the seafront and is one of the most beautiful parts of Curaçao. This upmarket neighbourhood is popular among Dutch people who have their second home here, with beautiful views over the sea, the city, the Spanish Waters, the Caracas Bay and other distant views. Willemstad is the capital of Curaçao. The city district includes several neighbourhoods of which Punda and Otrabanda are the main parts of the town. Anyone consulting a website, magazine article or book about Curacao, without exception will see a photo of the Handelskade. Behind the Harbour is the shopping district of the city.